The #MeToo movement that has swept across the U.S. and Canada over the past year has allowed women to speak up about sexual violence like never before. In politics and the media, powerful men are being held accountable for behaviour that has gone unchecked for far too long. In families, communities, and workplaces across the country, much-needed conversations are being started. We hope that change will follow. But as we watch celebrities, politicians, and newsmakers fall in dramatic fashion, it is important to remember that violence against women is not only perpetrated by famous and powerful men. It occurs every day, in every community. And too often, those who commit it are not brought to justice. Eight years before the #MeToo movement went viral, another movement was started. Not in Hollywood or on Parliament Hill, but on a remote highway in northern British Columbia. While hunting moose near the infamous Highway of Tears, where dozens of Indigenous women have disappeared or been found murdered, my father and I were inspired to start getting men involved in ending this violence. Taking the hide of the moose we brought down that morning, we cut up the first moose hide squares and started distributing them. The Moose Hide Campaign was born. Wearing a moose hide pin shows a personal commitment to ending violence against women and children. The pin starts conversations about gender-based violence and acts as a visible, tangible symbol of one’s commitment. Last year, the one millionth moose hide square was given away. Now our goal is to distribute 10 million. Paul Lacerte and his daughter Raven with the moose hide sqaures pinned to their clothes. 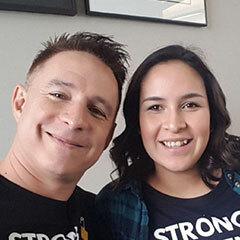 At our provincial gathering in Victoria on February 13, and at affiliated events across the country, Indigenous and non-Indigenous men will meet for the eighth consecutive year and take part in a daylong fast. Fasting is a simple act of sacrifice to show empathy for women who endure violence in their lives, and to show the strength of the fasters’ commitment to ending that violence. Our goal is to eventually have 1 million people in Canada fasting together. The #MeToo movement is about women speaking up, naming the violence they’ve experienced even if they can’t name the person who committed it. It has been moving and inspiring to see women come forward in such huge numbers. But so far, men have been mostly absent from this fight. In order for true change to occur — in order to truly end violence against women and children — men must be part of the solution. The Moose Hide Campaign is not about centering men in this conversation, but about holding space for men to have their own conversations. At the root of gender-based violence is toxic masculinity, which is demonstrated and reinforced by men every day, usually in ways they aren’t even aware of. If men want to end violence against women and children, they must take responsibility for this, and work together to replace it with a culture of healthy masculinity. Men must hold each other accountable, and most importantly, make sure that the behaviour they were once taught is not passed down to their sons, grandsons, nephews and brothers. This million-strong movement started with a conversation between a father and a daughter. It’s conversations like these that we will need to continue to have with family members, friends, co-workers, and neighbours in order to stand together and create a brighter future. As we prepare for this year’s Provincial Gathering, we are looking to the future, and the next million pins – and conversations – we will share. We hope that you will be a part of them. 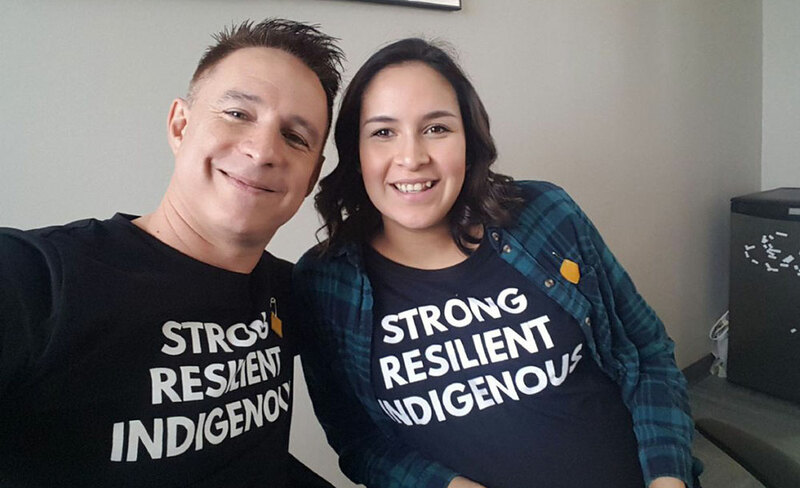 Raven and Paul Lacerte are co-founders of the Moose Hide Campaign. Find out more and take action at moosehidecampaign.ca.